Finding the parents of a female ancestor can be and often is a struggle. We need to look at all kinds of sources to get clues. Come with me down this rabbit hole. Nancy A Browning’s daughter named her mother’s parents as James Browning and Bettie Wallace on the death certificate. Searching for James and Bettie, I found a marriage record for James Browning and Elizabeth Wallace in Jackson County, Ohio dated 23 Dec 1838. Following this clue, I discovered them on the 1840 US census living as a couple in Jefferson Twp, Jackson county, OH. They were living next door to Archibald and Elijah Browning. All three men were similar in age; perhaps they were brothers. In the 1850 census, James and Bettie are living in the same township but now next door to an Andrew Wallace family that includes a John Wallace age 75. Could this be Bettie’s brother and father? The ages make sense. Let’s look at this John Wallace more closely. 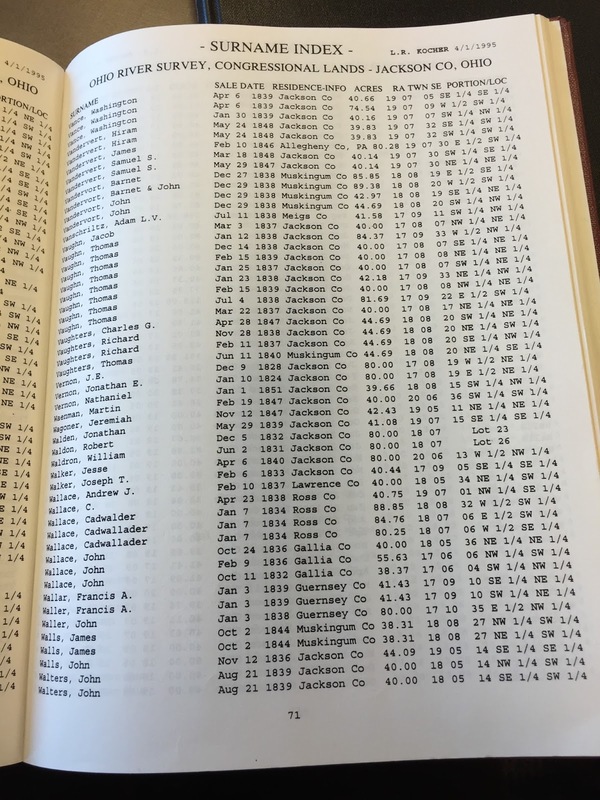 Through land records, I found a John Wallace of Gallia County who patented 38.37 acres of land in Jackson County in 1832 and 2 more parcels of 40 acres and 55.63 acres in 1836. (Ohio River Survey, Congressional Lands, Jackson Co, Ohio) Andrew Wallace appears to be living on one of these parcels. Stepping back to Gallia county, there was a John Wallace living in Greenfield Township in the 1820 and 1830 census. 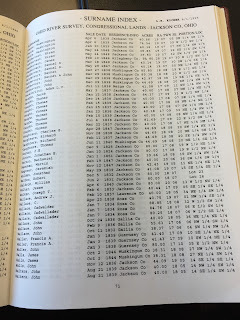 (Gallia County, Ohio Residents, 1800-1825, complied by Dennis R. Jones) He also paid chattel tax there. A Martha Wallace married Elijah Browning in Gallia County in 1831. Brothers marrying sister is not uncommon. According to subsequent census Martha Wallace Browning was born in VA. This could have been in what is now WV. Elizabeth (Bettie) was born in Ohio in 1815. So, assuming these women were sisters who married brothers, sometime between 1812 and 1815 John Wallace moved to Ohio from PA or VA. While I have not found the answers yet, it appears this family is intertwined. There are many John Wallaces in Ohio at this time, but only one family in Jackson and Gallia counties. Many people have this John Wallace confused with the John Wallace from Indiana County, PA. They are not the same.